gemstone strands. A rich, unique, earthy FavoriteBlings USA handmade statement necklace. hard to capture in the photo.) Cool tantalizing touchable tones heighten its abundant appeal. 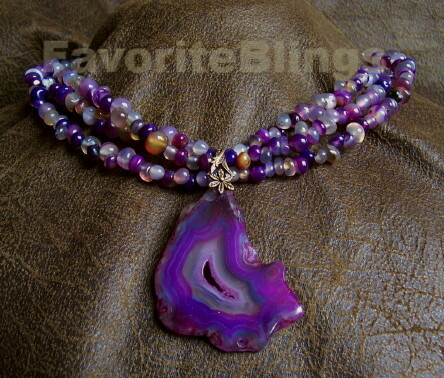 yummy array of colors makes the 4-6mm amethyst and agate pebbles so delicious. of this delicious druzy geode slice, the posh pendant is about 2-1/2" long, 1-1/2" at its widest. statement necklace is so different, a sweet temptation. Another FavoriteBlings exclusive. Such a rave-worthy gift to surprise your favorite diva! Own this showy druzy and amethysts necklace at my Etsy shop!